How to Color Your Map Using SCIENCE! Sketching out a map for a setting can be a lot of fun. Drawing a map gives you a bird’s-eye view of the world, a way to spatially organize plot arcs, and can be a great piece of artwork in its own right. But like most works of fiction, the creator should remember to keep it as believable as possible. This might be less important or less possible for unrecognizably alien worlds. Maps of Earth-like settings, however, can benefit from following some basic rules. Forests, tundras, deserts and plains don’t appear arbitrarily. These biomes are located where they are on Earth due to the way air and water circulate in the atmosphere – and any Earth-like world should follow the same basic rules for its atmosphere that Earth does. But who wants to spend time researching atmospheric science just to know which parts of their map to color green, brown, or beige? Well, I do, so let me save you some trouble by relaying what I’ve learned. The equator gets hotter than higher latitudes. Warmer air holds more water. The planet rotates from east to west. Circulation of the Earth’s Atmosphere: the Six Cells. Image by NASA; public domain. At the sun-soaked equator, hot air rises high into the atmosphere and begins to travel away from the center. At 30° latitude to the north and south, a third of the way to the poles, the air has finished cooling again, and falls back to Earth. Its journey has wrung out much of its original water content; as it descends on latitude 30, it brings almost no rain. But this air isn’t about to stay put. It travels now along the surface, either poleward atop the mid-latitude cell, or back to the equator. When moving poleward, it picks up evaporating water along the way, and when it crashes into the polar air to the north or south, it drops a deluge before ascending again. 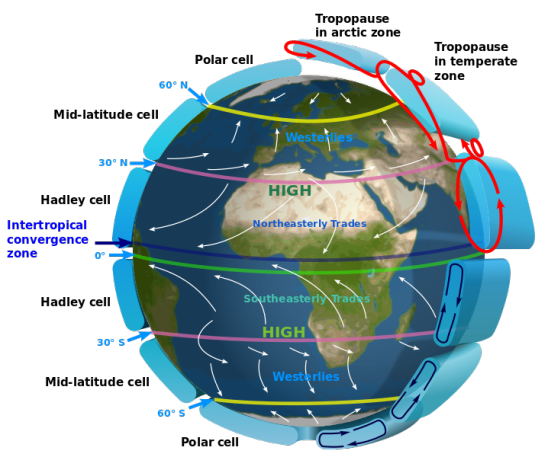 The latitudes where air descends as it converges (about 30°N and 30°S, and arguably the poles) tend to be clear-skied and dry, and latitudes where air masses collide and ascend are cloudy, rainy, and lush. Since these winds travel along the surface, mountains can divert them or push them upward, causing them to spill their water on the windward side while leaving the leeward side dry. The result: rain shadows. So, knowing all this, what mapmaking rules can we deduce? Let’s try an example. 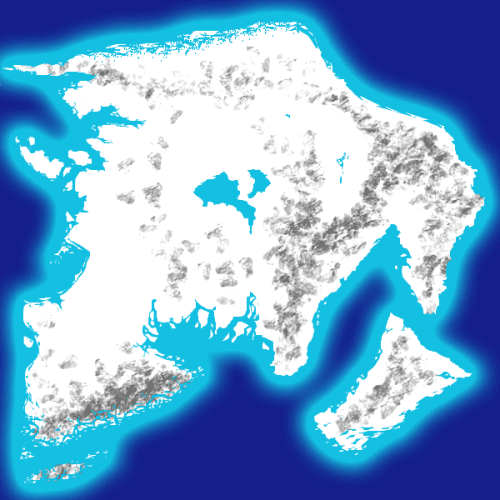 If we start from the map below (mountains in gray), which biomes can we expect in which regions? If this landmass is the size of, say, Hawaii, then our job is easy; we just need to know its latitude. If it’s in the dry belt near 30° latitude, it’s, well, dry. Otherwise it’s fairly wet, and therefore can be colored green, except for the leeward side of the mountains (west near the equator, east in the colder latitudes) which will be in a rain shadow. 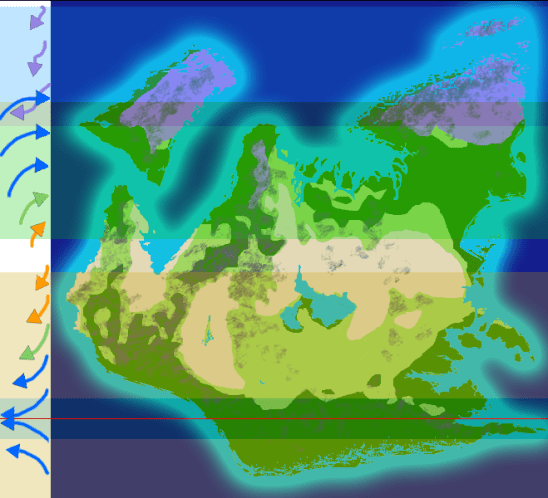 Of course, most world building is done closer to actual world scale. What if this hunk of land is a full-blown continent? In this case, things get a bit more complicated. 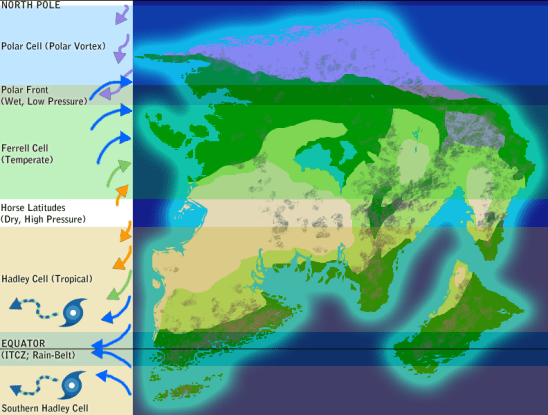 We’re going to want to overlay an Earth-like chart of the climate zones and wind patterns to get a full picture of what’s going on, and which regions need to be wet, dry, or in-between. The arrows on the left are key to understanding the climate patterns I’ve filled in. They represent the normal directions of surface winds, and how wet or dry they are. 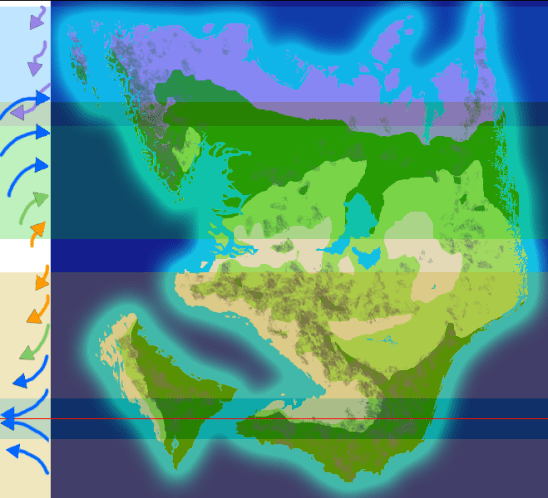 Blue is wet wind, orange is dry, green is in-between, and purple* is frigidly cold and polar. Poles are cold, and more cold equals more wet. This is pretty basic, but it’s worth a reminder: get close enough to the top or bottom end of a planet and everything is just ice, regardless of how wet or dry everything is. Antarctica is the Earth’s largest “desert,” in terms of precipitation, yet it’s paradoxically the Earth’s largest reservoir of fresh (and solid) water. The reason is simple: it’s too cold for water to evaporate. * Stepping back from the poles a bit, we find that stereotypical deserts (sand dunes and scrubland) are rare; cold water evaporates so slowly that wet forests and bogs are common even where rainfall (or snowfall) is low. Conversely, regions that receive a lot of rain can still be relatively barren, if they’re hot enough. Nigerian grassland receives more rainfall than a Minnesota forest. So where should your deserts be, exactly? Even though the planet is driest in the band around 30° latitude, deserts tend to skew equator-ward a bit, due to more direct sun exposure – and thus increased evaporation rates – nearer to the equator. Similarly, rain-shadows in the far north don’t tend to cause deserts, just drier plains or tundra. Coastlines of any kind will help moderate and moisten the climate, since incoming winds will be able to easily gain evaporating water from the ocean; they’re not always enough, though. Western coasts in near-equatorial regions can be quite dry, especially if a mountain range rises directly to their east. An Earth example would be coastal Peru. What do your mountains look like? Mountains don’t just stop rain, they CATCH it* – their windward sides tend to be very lush. They’re also colder than their surroundings due to altitude, which makes them even more likely to support forests. Tall mountains located deep in otherwise arid regions are often islands of green. What impact will lakes have? Large lakes act just like miniature versions of oceans; the winds that pass over them become moistened, watering the lands beyond. They’re great at breaking up deserts – so long as they’re deep enough that they can survive existing between deserts. * Note that lakes stop moistening the air when they freeze over – but a lake that freezes over is probably located somewhere so cold that it really doesn’t need much precipitation to stay forested. Most regions are only as wet as whatever’s upwind. Places downwind from oceans and lakes (with no mountains in the way) are obvious choices for lush regions, but bodies of water aren’t the only wet things out there. Forests, wetlands, and other soggy regions behave in nearly the same way: water that evaporates from them moistens land downwind. * This gives rise to a significant feedback effect: chop down a large forest, and in climate terms it’s as if you’ve replaced an ocean with dry land. Regions downwind will receive less rain. Examples are probably the best way to get a feel for how these climate rules work. One example is Earth, of course, and another appears in the image above. But what would happen to our example continent if we rotated it? Here we have a 90° rotation from the original. Deserts still appear in the middle, forests are still on top and bottom. The polar region is, as always, on the very top* – but it also stretches southward in regions of high elevation. The temperate forest band has shrunk somewhat, but the equatorial jungle has grown; the rich southern forests would be thoroughly (but transiently) watered by the seasonal monsoon. A 180° rotation makes for a complicated mix of climate patterns. This map has a good deal of wiggle room; much depends on just how tall these mountains are, and how often rain-bearing hurricanes slam into the mid-latitude coastlines. But the general patterns hold. 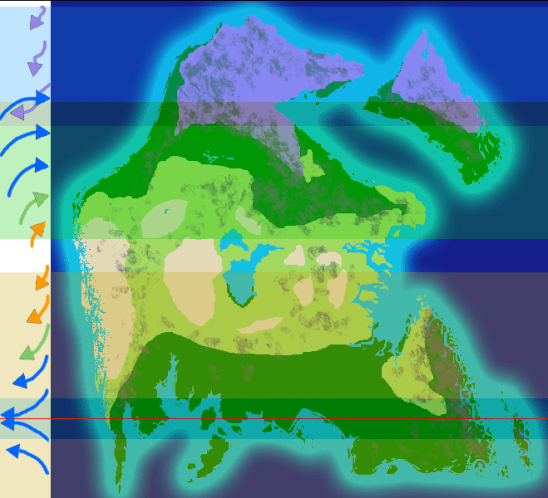 Throughout these examples, we see some regions (like the Alaska-esque peninsula with the fjords, and the large island-continent) stay mostly wet, while other regions (e.g., the basin in the final map’s southeast, surrounded by mountains on almost all sides) are always drier than their surroundings. 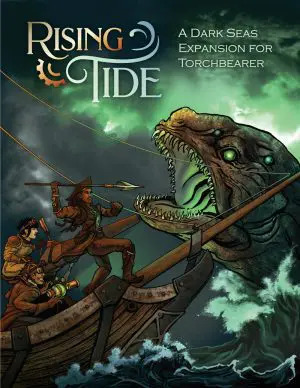 The rules of speculative fiction and fantasy cartography are really only guidelines. But that doesn’t mean we should take for granted how things work on Earth, especially since fantasy worlds tend to be Earth-like by default. Even when the world deviates from Earth in a major way, we can still expect it to follow a set of climate rules; we can look to the solar system’s other atmospheres* for guidance, or extrapolate from known Earth phenomena. * And if parts of your world don’t jive with the predictions of climatology, it’s still worth identifying and justifying them. Maybe there’s an out-of-place desert on that equatorial island because…a wizard did it? A terraforming experiment gone wrong? The Sand Spirits finally vanquished the Moisture Lords? Creative deviations are up to you – but hopefully you’re now able to identify them for what they are, or avoid them where believability is crucial. Our atmosphere is largely transparent excepting cloud cover, so its bands aren’t as obvious as similar patterns on striped Jupiter, Venus, Saturn, and so on. 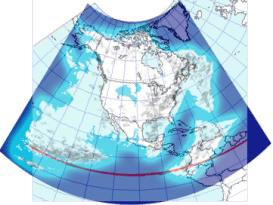 The boundaries of the polar and mid-latitude cells are a bit more fluid and seasonally-dependent; weather above 35° latitude or so tends to be less predictable than elsewhere, which is why many Europeans and Americans don’t appreciate how clockwork-organized our planet’s airmasses and weather typically are. Incidentally, the sort of terrain humans evolved in. These have wavy lines, because while they typically blow east to west, they’re more chaotic and seasonally dependent than the others. Hurricanes are so interesting and complex that they’d need one or more separate posts to properly explain them. They require warm water and low wind shear to form – so they can only spawn near the equator. But they also require the Coriolis effect, so they can’t form or stay active within about 5 degrees of the equator, where this effect is almost non-existent. The hotter water can get farther from the equator, the more hurricanes are created. Antarctica is also colder than the Arctic, because having a continent at the pole instead of an ocean means the ice sheets can grow larger. Bigger ice sheets means a greater ability to reflect heat from the sun, causing a feedback loop that results in even bigger ice sheets. Overall, the southern polar cell is stronger and colder than its northern twin. The air quickly cools and becomes saturated in water (thus forming clouds and rain) as the mountains force it to rise: Orographic Lift. The topography of many deserts are such that they could form large lakes, if there was enough precipitation. In fact, since they heat up faster, they can moisten the air BETTER than cold, deep oceans – at least in summertime. They just don’t moderate temperatures as well. despite that the waters just off their coastlines will be WARMER. Oceans follow the same trends as continents: the western edges of an ocean trend warm for their latitudes – the Gulf Stream is very warm, for example – while eastern edges trend cold. The east coasts of China and the United States also curve southward; fill in the South China Sea or the Gulf of Mexico with dry land, and regions far to the northeast (for example, New York or Beijing) would be noticeably drier. Since we chose to place our example continent in the northern hemisphere of its planet. If we were to continue the analogy to Northern Canada, this region would be dotted with blue lakes. Mix subarctic biomes (slow evaporation) with solid, rocky terrain (poor drainage) and you get a sprawling patchwork of lakes. Rotate the region into the sub-tropics, and the lakes would likely disappear. The Intertropical Convergence Zone, also known as where the Tropical Hadley Cells from the northern and southern hemispheres meet. This image shows the seasonal range of the ITCZ. 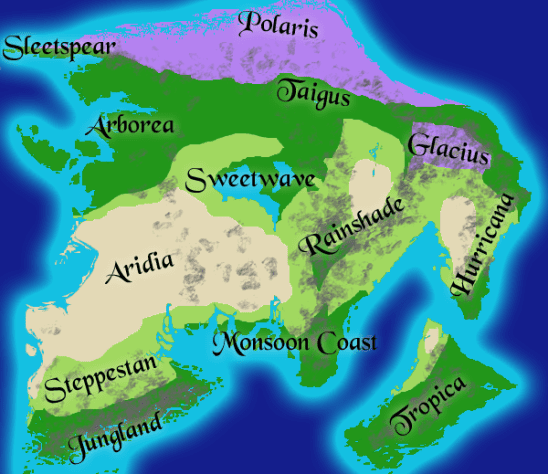 Especially the Tilted-Earth worlds of Seapole, Shiveria, Jaredia, and Turnovia. For example: a hotter, faster-spinning world will have larger, more frequent hurricanes. Or, a west-to-east rotation just reverses all the wind directions and flips the roles of the east and west coasts. Wow. There is so much information here! I will admit, I took more than an hour to go through it all. But it was worth it! My main problem in terms of worldbuilding is INFORMATION OVERLOAD, and yet I absolutely love thorough articles on interesting “what ifs” like this one. I will now retreat from the internet for the next few days and let all this data sink in. This is really great. Thank you for compiling these guidelines! Thanks Alyssa and Amit! Glad this could be of use. 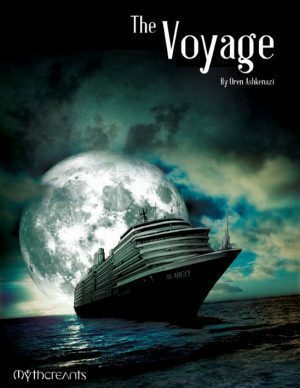 Now might be a good time to plug the sequel I have coming this Sunday. By the way Amit, I love your hex grid resources. Good stuff.